Euphoria is back for 2017 and bigger than ever. With a lineup too good to be true, and a location fit for musical magic, missing it this year will be a major mistake. Euphoria is a family of doers and creators. The festival, known for its inclusivity of variety genres with esteemed and emerging talent, not only supports the music community, but other art outlets as well. Stay on site at the campgrounds and up your artistry networking game with fireside chats over nitecaps and s’mores. 2. This year, Euphoria has combined forces with Art Outside, and has transformed the festival into a completely immersive experience! Say hello to on site art installations, music, yoga, workshops, and performances all weekend long! Thank you Art Outside! Announcing a collaboration for the ages — @artoutsidefest Village at Euphoria! Along with the producers of AO, we will host curated art installations, workshops, yoga, music, performances & much more at Euphoria 2017. More info: http://bit.ly/2kSynaq ? ? 3. Euphoria is also sweetening the pot further by offering Art Outside 2015 festival goers with special discounted rates. 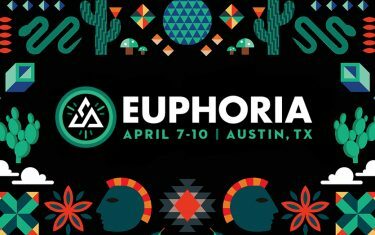 Making sure they don’t leave anyone out, Euphoria is offering everyone a chance to save 10% on tickets with promo code ARTOUTSIDE. Just a few more sunsets left until we meet again ??☀️? 4. The Dragonfly Initiative is another special addition this year and is a dedicated space for creative participation and community involvement. The mission? To select and showcase inspiring, creative and thought provoking exhibitions for the Euphoria community. The initiative encompasses the annual Work Exchange Program, as well as several new opportunities to get involved, like the Art Installation Grant application. "If you can dream it, do it." -Walt Disney ? 5. The festival’s Work Exchange Volunteer Program provides artists plenty of opportunity to build their resume. Go behind the scenes and learn the ins and outs of one of the most diverse festivals in the country. If nothing else, working 15 hours gets you a free festival ticket. 6. Calling all dancers, yogis, painters, performers and instructors of the arts to Euphoria Elements Team! Whether you are a professional performer or simply want to provide happiness and information to fellow patrons, Euphoria wants to provide expressionists a platform to shine and a chance to collaborate with festival producers. 7. Euphoria is more than just music, it’s a commitment to the environment. This year, Ecophoria is offering more avenues for community engagement through local Austin organizations. Artists have the opportunity to win an art grant by creating a new take on trash receptacles. 8. #FINDYOUREUPHORIA Community Stories allows writers to anonymously submit life lessons! Those chosen are featured on the Euphoria Facebook page. Submit your story to share the love. You've got a friend in me. ? 9. Euphoria is giving three design pros a shot to showcase their work. Winners of the Creative Allies Poster Contest receive up to $500, (2) GA passes to the festival, and the opportunity to create a piece of Euphoria history. Additionally, the Top 5 designs will be featured on all of Euphoria’s social media channels, a huge platform for exposure for local budding artists. 10. Euphoria weekend provides real time inspiration that can only be realized in the sanctity of nature. Each year lays the foundation for the next. This festival allows artists and fans to both live in the musical moment and plant the seeds to create the exceptional. Your journey to find Euphoria is calling. What are you waiting for? ?✌️️ ? Don’t miss out on your chance to experience the magic of Euphoria 2017.